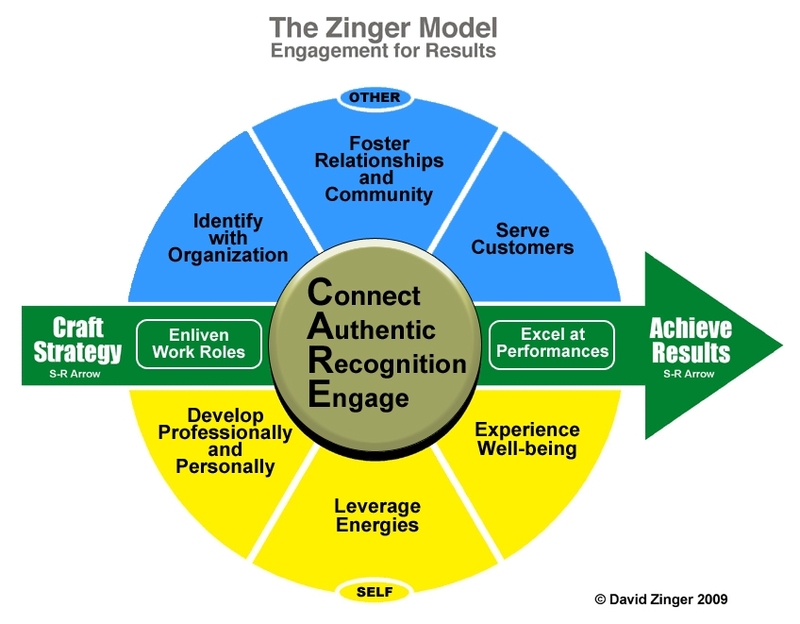 David Zinger voiced a 3 minute video overview of his Employee Engagement Model while in Poland earlier in 2010. One element of the model has changed since then from Achieve Happiness to Experience Well-Being. If you would like to learn more about the model and each part, click here. Click on the model above to get a larger view. David Zinger, M.Ed., is an employee engagement writer, educator, speaker, coach, and consultant. David founded and moderates the 2380 member Employee Engagement Network. His website offers 1000 posts/articles relating to employee engagement and reached over 1,000,000 page views in under 4 months in 2010. David is involved in the application of Enterprise 2.0 approaches to engagement and the precursor, creating engaging approaches to communication, collaboration, and community within Enterprise 2.0.